Forests are relevant to climate, air quality and water balance, they are important because of their high biodiversity and bioproductivity, and, moreover, they are a direct source for food. Affected people and foundations of life: About 4.6 billion people depend on forests for their water (MA [Millennium Ecosystem Assessment] 2005, 29). Deforestation has risen the risk of malaria in Africa and South America by increasing the habitat suitable for mosquitoes that transmit malaria (MA 2005, 114). Targets/goals: to reverse the loss of forest cover worldwide by sustainable forest management (target of UNFF [United Nations Forum on Forests] 2006, 3). 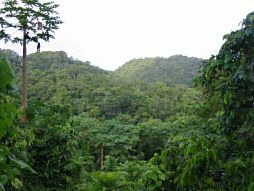 Trend: + The annual net loss of forests has reduced from 8.9 million hectares in the 1990s to 7.3 million hectares in 2000-2005 (equivalent to the area of Panama; UN 2008, 38, and 2006, 16f.). A decrease by 13% of global forest area is projected from 2005 to 2030 (OECD 2008, 205). To reach the target of UNFF, net loss has to be reduced to zero. Measures: Sustainable forestry is to be extended (UN Declaration on Forest Principles 1992): setting standards for intensity and species of logging; the obligatory implementation of environmental impact assessments; fees or charges for logging and trading; taxation on the conversion of forest land to other uses; subsidies for afforestation; removal or reform of existing subsidies for logging or establishing plantation forests or agricultural fields on natural forest land; and eco-certification (OECD 2008, 206). Trading of illegally felled timber has to be supervised and restricted. The World Bank finances more than US$ 300 million in forest law enforcement and governance activities (WB 2006, 2). Poverty reduction, soil protection, and access to modern energy can open up alternatives to depletion. Recycling of paper can be expanded, and wasting of paper reduced.